J.K. Simmons: Arthur Rock, major shareholder of Apple Computer Inc. 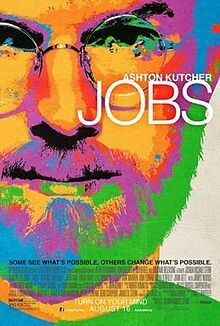 Billed as the story of Steve Jobs from 1974 while a student to 2001 with the introduction of the iPod it really skips over huge chunks of time including the last 15 years of his life. With the emphasis on the business side of the man, short shrift is given to his personal life: some people simply disappear and are no longer mentioned whereas others pop-up unexpectedly without explanation. In mannerism, physique and voice Kutcher truly portrays the man with what is probably his best performance to date. A tad too long at two hours and seven minutes there is ample opportunity to whittle it down by eliminating the swirling about in the tall grass or the entire jaunt to India that do not add anything to the storyline. for some drug content and brief strong language. Pong, the first computer video game, was developed by Allan Alcom not by Wozniak. The Apple II was introduced at the West Coast Computer Faire, spelled with an e not Fair as shown in the movie. A half empty bottle of beer on the table in front of Jobs is out of place: throughout his life he was a teetotaller and would not have touched the stuff.